COLUMBUS, Ohio – The weather’s finally warm, the sun is out, and now, so are the ticks. And this year, tick season in Ohio is expected to be pretty bad, says Glen Needham, a retired entomologist and tick expert formerly with Ohio State University Extension, the outreach arm of the College of Food, Agricultural, and Environmental Sciences (CFAES) at The Ohio State University. Already, Needham has collected the first blacklegged or deer tick nymph of the season in Coshocton County, and he said that this is just the beginning of what people can expect to see as tick season ramps up. “With the extended winter cold we’ve experienced this year and the slower to develop spring weather, you can expect to see a lot of ticks starting to come out all at once,” Needham said. “Think of it as kind of a tick logjam. For example, soil temperatures have to reach zero to minus 5 degrees Fahrenheit to freeze dog ticks, he said. With the rising tick population comes the risk of contracting tickborne illnesses such as Anaplasmosis, Babesiosis and Lyme disease. Lyme disease is the major threat associated with deer tick bites. Most Lyme disease cases occur during the summer when the poppy seed-sized nymphs are most active. Lyme disease is caused by the bacterium Borrelia burgdorferi and is transmitted to humans through the bite of infected deer ticks, according to the Centers for Disease Control and Prevention. Symptoms of Lyme disease, which can appear days to months after a tick bite, typically include fever, headache, neck stiffness, joint pain, facial palsy, heart palpitations, dizziness, fatigue and a characteristic skin rash. Lyme disease and other arthropod-borne diseases spread by ticks, fleas and mosquitos have tripled in the last 12 years, with Ohio among the states with high rates of infections, according to a new report from the CDC. Lyme disease specifically is on the rise in Ohio, Needham said, with more than 270 reported cases in 2017 alone, according to the Ohio Department of Health. While Lyme disease can be treated with antibiotics, it can be an arduous, debilitating disease, Needham said. 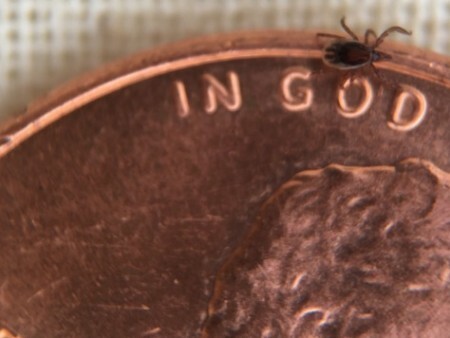 The best way to beat Lyme disease is to prevent tick bites, he said. This goes for pets too, with dogs being vulnerable to Lyme disease infection. Use of veterinarian-recommended anti-tick products and Lyme vaccines are even more important with the expansion of infected tick populations. “It’s important to know the kinds of ticks, how to prevent getting bit, and if you are bitten, how to remove them, considering that deer ticks have been reported in some 70 of Ohio’s 88 counties,” he said. Deer ticks are typically found in wooded areas, while American dog ticks are found in grassy habitat next to woods, road edges and paths, feeding on animals including deer, birds and rodents. They can range from poppy seed-sized in the nymph stage, to watermelon seed-sized in the unfed adult stage, to grape-sized when fed, Needham said. Wear light-colored clothes including shirts with long sleeves with the hem tucked into your pants and long pants tucked into your socks or boots. Apply a tick repellent according to label instructions. Do frequent tick checks of your body while outside and a thorough inspection at shower time. Protect your pets with an anti-tick product recommended by a veterinarian. Keep dogs on a leash and avoid weeds. Do not crush or puncture it. Grasp the tick as close to the skin as possible using pointy tweezers, a tick removal tool, or your finger and thumb. Pull straight up and out with steady, even pressure. Thoroughly wash the bite site, your hands and the tweezers with warm soap and water. Place the tick in a container with rubbing alcohol or hand sanitizer. Record the day the tick was likely to have attached. Take the specimen with you to a healthcare professional if you develop flu-like symptoms, a rash or anything that is unusual for you. To help Ohioans learn more about ticks and how to keep people and pets safe, OSU Extension has developed a webinar and website with information about tick biology, tick identification and tickborne diseases. The site can be accessed at u.osu.edu/tick/.